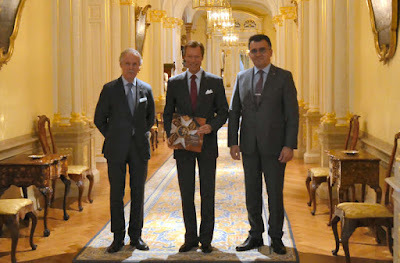 Today, Grand Duke Henri received photographer Marc Schoentgen and historian Pierre Even for an audience at the palais. The duo presented the Grand Duke with a book entitled Die Dynastie Luxemburg-Nassau / La dynastie Luxembourg-Nassau in German and French. In case you hadn't guessed yet, the book is about 'The Dynasty Luxembourg-Nassau' and was published recently to celebrate the 125th anniversary of the House of Nassau-Weilburg in Luxembourg. The book, which I can't wait to get my hands on, is available in German and French via Éditions Saint-Paul and costs 49 euros.